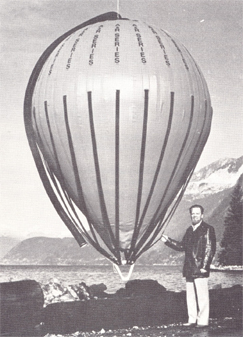 Don invented and patented the world’s first inflatable pontoons for float planes. The cushioning effect of these floats has saved countless lives in situations of forced landings, including on ice and snow, even collisions with hydro poles. Don and the team at SEI created new seaming techniques for fuel storage bladders known as Terra Tanks. These new seaming techniques created much greater security for fuel stored in the remote site tundra of the North. They are used by militaries world wide for equipment refuelling. Canadian Peace Keeping missions by the Canadian Army use this product. Bladder tanks were initially used by the military but, today, they are most often used in operations around the world for storing fuel, water and chemicals. Typical clients include mining, oil and gas exploration companies, remote construction companies, helicopter operators and disaster relief operations. Read more about this invention on the SEI Industries website. Helicopter transport of fuel to remote sites was a problem Don sought to solve. He pioneered a solution with a product called the Fuel Easy. 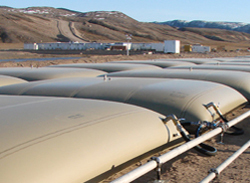 This transportable fuel cell replaced the outdated fuel drums used by most operators and provided a non-contaminated source of fuel for all remote operations. 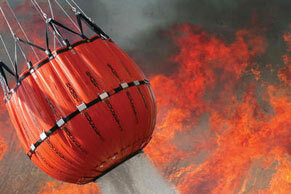 The Fuel-Easy makes transporting fuels by helicopter smooth and straightforward. No matter what the climate or conditions, the Fuel-Easy can deliver fuel anywhere it's needed. With its innovative external-frame fabric container, the Fuel-Easy takes much of the risk and guesswork out of fuel hauling. The Fuel-Easy is fully collapsible and offers operators greatly increased fuel hauling capability, easier fuel handling, reduced cost and wastage and the assurance of clean fuel. In use on five continents, this lightweight, flyable fuel container is a convenient and cost-effective alternative to fuel drums. When there’s no gas station in sight for hundreds of miles, fuel supply becomes a critical aspect for the military and many other industries including mining, construction, aviation, resource exploration and forest firefighting. It’s why SEI Industries developed its new Bulk Aviation Transport Tank (BATT) – the world’s first collapsible, double-walled, baffled transportation tank that allows users to safely carry bulk fuel to remote sites via aircraft. The BATT has won four awards to date — an international outstanding achievement award (technical category), an honours program award (industrial applications category) and a regional and national award for innovative new technology. It was with this product that I got my introduction to industrial fabrics. The fellow who owned the company (Ralph Somerville) is standing next to the balloon in the top photo. He was making a very small part for another product that I had at the time and one day I asked him how business was. He told me if things didn’t turn around he would be out of business in 6 months. I asked him why and he said when they started their company they didn’t have money to hire a full time marketing person. 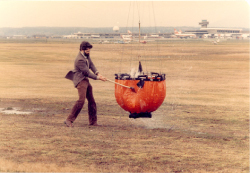 I told him we should spend half a day and talk about every product he had ever been involved with and one of these was a number of these lifting balloons they made under contract as a piggyback product to the sale of underwater submersibles. He had one dumped in the corner of his shop which had been there for awhile and was all dusty. We hauled it out and had a look and I could see right away it was really primitive. I researched the underwater lifting balloon (bag) marketplace and discovered there were only two other manufacturers out there. We found a mechanical engineer that had some experience with fabrics and worked with him to design a far more advanced balloon. One of our customers was the RCMP and they would use our balloons to lift sunken (stolen) cars. The problem was that if the balloon wasn’t completely full with air just when the car started to lift, as the car and balloon ascended in the water, the air would expand with the diminishing pressure and the entire load would accelerate upward often with cars leaping from the water – potentially a very dangerous situation. 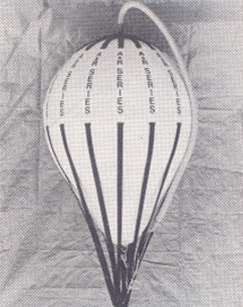 I invented an extremely simple “Continuous Automatic Buoyancy Control” (CABCO) which consisted of a hose from the top of the balloon. Just when the load would start to lift, the diver would tie the hose so that it would just bubble air. The expanding air would simply escape from the hose and the lifting load would remain constant and under full control. It was a significant innovation at the time. As for Ralph’s problem with lack of sales, within 8 months or so he had a new problem to deal with. We were selling so many lifting balloons he didn’t have enough capital to buy all the raw goods to make all the balloons I was selling. I always liked to tell him it was a good problem. That's the process of inventing. The way I do it is I look at the problem to be solved from as many angles that I can think of at a given time and then I just let go of it (stop "thinking" about it) and then deeper and more powerful and more creative levels of the mind go to work on the problem at hand and the solution presents itself. The Yak Trak is a trailerable off road vehicle used in conjunction with a 4 x 4 pickup truck or SUV (the drive vehicle). It is intended to fill the present market gap in off road capable vehicles that exists between small units (ATV’s and snowmobiles) and large industrial units such as Snowcats and Tracked Vehicles as are used for oil exploration and by the military. The Yak Trak is towed to the end of the driveable road or surface. The Tracks are hydraulically folded down from the trailering position onto the ground. The Pickup or SUV is driven onto the Yak Trak using ramps. The Yak Trak trailering wheels are then folded up hydraulically. The drive vehicle is driven in a more or less normal manner. The drive vehicles wheels contact rollers similar to dynamometer rollers that hydraulically drive the tracks of the Yak Trak. The Yak Trak is capable of traversing soft snow, mud, sand and other surfaces that would stop a 4 x 4 vehicle. It is capable of carrying a significant number of people and payload. It can be stored and used anywhere due to its ability to be trailered on the highway. There are many uses for the Yak Trak, including personal access to winter or remote cabins, hunting, wilderness tourism, servicing of remote sites, oil exploration, surveying, crew transport, snow grooming – anything that requires the ability to carry a number of people or a significant payload on terrain that is not accessible by a 4 x 4 and doesn’t justify the purchase of a heavy duty and expensive industrial tracked vehicle. Rescuing an injured or unconscious victim at sea is difficult, especially in rough waters, because they are not able to help themselves. Jet Net solves this problem. 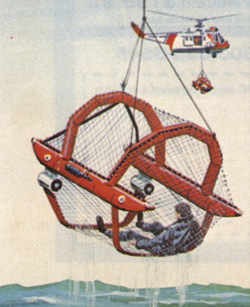 Emergency responders can send out this self-propelled basket, scoop the victim up in it and haul them to safety without having to risk the lives of rescuers. 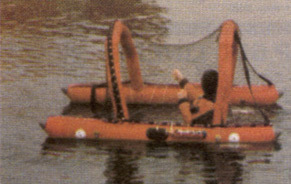 The remote-controlled rig, which can be launched from a ship or helicopter, is supported on inflatable pontoons and powered by two variable-speed, reversible electric thrusters that permit it to be steered by rescuers through the water to the victim's location.